Synopsis: An accomplished headhunter risks everything to obtain a valuable painting owned by a former mercenary. Review: Now that Sweden’s The Girl with the Dragon Tattoo trilogy has been published and the movie versions are getting released, it’s time to look at the works of another Nordic author that’s been a hot commodity in Norway. It’s safe to say that Tattoo’s late author, Stieg Larsson, paved the way a bit for Norwegian Jo Nesbø’s crime novels to get some visibility in the US. Tapping into that same chilly vein, Nesbø has a knack for creating stories with flawed characters you reluctantly root for. While some may think that Nesbø’s bestseller “The Snowman” may have been the film we’d see it’s actually the older Headhunters that’s seeing the light of the silver screen first. At its core, Headhunters has a fairly routine set-up filled with the requisite double/triple crosses, femme fatales, and a decent amount of bloodletting. What sets this Norwegian produced film apart from your direct to video fare is a healthy set of twists to what you expect that keeps you on edge and unprepared for what’s coming next. Adding a layer of comedy to the mix is one of those unexpected delights that feels totally right even though a times its so wrong. There’s an outhouse set-up that had the audience roaring at the same time they were ‘ew-ing’…it’s pretty brilliant. Foreign films aren’t afraid to take their violence to the extreme and there are several stomach churning moments that led me to involuntarily avert my eyes. Now you may read that last sentence and it could be a deal breaker for you – please, don’t let it be. Headhunters is one of the better movies I’ve seen in 2012 and boasts terrific performances under the watchful eye of a director that knows what he’s doing. It’s a technically grand film with impressive cinematography and a dynamite score that is in perfect harmony with what is developing onscreen. Even when you think that the film can’t possibly untangle itself from the web its weaving it manages to do so without apology or resorting to a cheap payoff. Right from the start the movie has to win us over because our lead hero (Hennie) is actually a not very nice guy. A seemingly bland headhunter by trade but art-thief in practice he’s got a comfortable life with a stunner of a wife (glamazon newcomer Macody Lund). With mounting bills and a lifestyle to support he’s out for one big score and he sees possibility when Clas Greve (Coster-Waldau from Game of Thrones) arrives on the scene. But Greve has some, um, grave secrets that are unearthed and that’s all I’ll say because to give away more would expose some plot turns too interesting to spoil. Even though a remake is (naturally) in the works be the cool person in your office and see the original now. 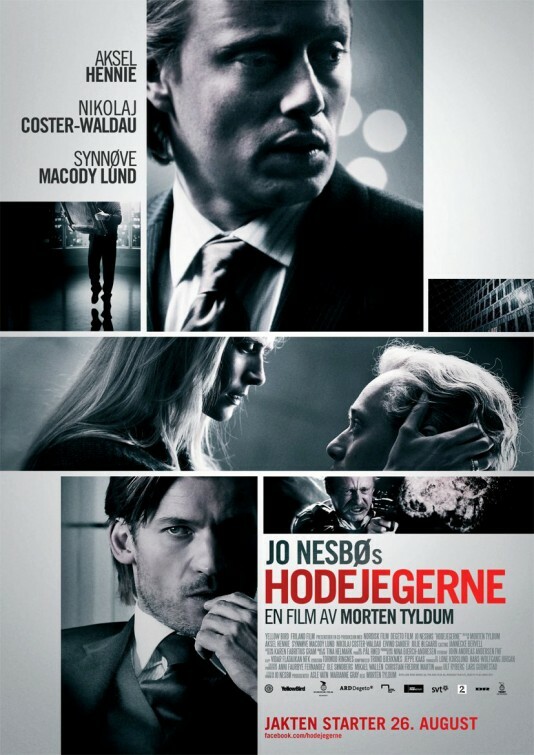 Subtitles in Norwegian will keep you busy reading as you watch the events develop on screen but try to keep up because this film waits for no man (or woman). Once the film takes off about thirty minutes in it doesn’t give you a chance to breathe — cars crash, heads roll, secrets are reveled, and more than a little blood is spilled. It’s a first rate thriller that proves you don’t need a dragon tattoo to create sparks.